This serving bowl and platter are the two remaining items in what was once a multi-piece set of china dinnerware that my Mom Jacqueline owned. When I recently talked to her about these dishes, she remembered that it was a service for eight. She didn’t recall when or where she bought the dishes, but said it was after I was born, when we lived in Timmins, Ontario. She also said there were other patterns and colours, but that she liked the yellow roses, so chose that one. 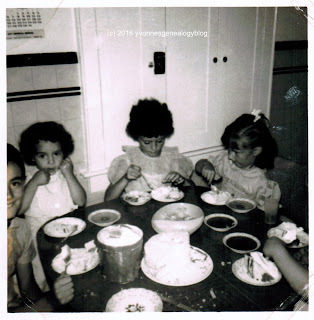 I checked our photo albums and found one picture where my cousins and I are having cake and ice cream on plates from that set on my birthday in July 1961. (See the small plate in the lower centre of the image.) I knew these beautiful dishes weren’t our everyday set, but I thought Mom reserved them for Easter, Thanksgiving, and Christmas. Now I know she also used them for birthdays. The serving bowl measures about 22 cm (about 8½”) in diameter and is about 6 cm (about 2½”) deep. The oval platter is 34 x 26 cm (about 13½” x 10”). Each piece has a 22 kt gold, filigree-patterned border (with some fading in places) at the rim. In the centre are yellow roses, buds and green leaves on a cream background. The glaze shows some crazing, but both items are free from chips or cracks. “Georgian China / USA Origin / 22 KT. GOLD” is stamped on the reverse side of the bowl and platter. According to Grey Roots Museum & Archives, Georgian China, a Canadian and US-based company, was established in 1948 and closed in the 1970s. This Sunday, I will follow tradition and use Mom’s Georgian China at our dinner on Christmas Day. Beautiful serving pieces that will bring family memories to your holiday table every year! And maybe spark conversations about family history?! Lots of family memories are tied to this china, Marian. Thanks for commenting!